A motorist told a fatal accident inquiry this week how he watched a lorry run straight into the back of a tractor towing a trailer on the A7 just outside Galashiels. The collision near to the entrance of Torwoodlee golf course claimed the life of 54-year-old railway construction worker Huw Jenkins, from South Wales. Alastair Brearley told the hearing at Selkirk Sheriff Court how the heavy goods vehicle crashed into the back of the tractor and trailer on a straight stretch of road around 3.15pm on May 1 last year. The 67-year-old garage owner described how the back of the trailer went down, but the “front end rose like a horse on two feet”. Mr Brearley said there were bits of glass and debris from the front of the lorry as he passed, but when he looked in his wing mirror the vehicles were still moving. 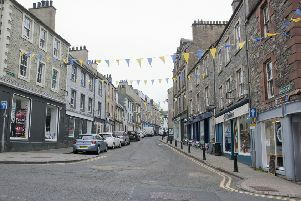 Police witnesses described how they raced to the accident scene, but on their way noticed a Hawick Plant Auctions lorry which had come to a halt outside the Salon 55 hairdressers in High Buckholmside, Galashiels, with a front bumper and metal grille at the front badly damaged, and a cracked windscreen. PC Darren Howlett said he approached the driver, John Boyes, who was in the passenger seat. PC Howlett said the lorry’s paperwork was in order, along with the tachographs, while an alcohol breath test was negative. Special Constable Mark Laidlaw said Mr Boyes was under the impression his lorry had been struck by another vehicle. The hearing was told Mr Jenkins, of Tonmawr, had been thrown through the rear window of the John Deere tractor and was lying on the road dead by the time police arrived. The inquiry into the death of Mr Jenkins, who was working for BAM Nuttall on the Borders Railway, continues.